Montgomery is a Future Resilience Leader for Virginia Sea Grant, an organization that advances the resilience and sustainability of Virginia's coastal and marine ecosystems and the communities that depend upon them. Montgomery is one of the leaders of the Coastal Community Design Collaborative (CCDC), a group of student architects, engineers, and marine biologists that develop innovative designs to help Hampton Roads neighborhoods deal with flooding. No one person is responsible for cityscapes: Planning involves large groups of people. No two cities or towns are alike, so for each project, urban designers must consider the unique characteristics of each neighborhood, such as areas that flood or high-traffic areas. The types of land in the city affect what kinds of structures can be built and where. Urban designers are in charge of arranging city structures. They focus on the big picture: the neighborhoods and cities as a whole, rather than individual streets and buildings. Their goal is to design cities that fit in with the natural world around them and allow people to get where they need to go. What are some jobs available in urban design? Urban design involves collaboration between many different disciplines: landscape architects that design things like parks and plazas, city planners that help determine the best use for a city’s land and resources, and engineers that help design buildings and roads. What are the job prospects here in Virginia? There are approximately 1,240 people employed in urban and regional planning, and the annual mean wage is $73,390 in Virginia, according to the Bureau of Labor Statistics. Approximately 10,190 people work as civil engineers in the state of Virginia, and they earn a mean yearly wage of $91,990. There are approximately 740 landscape architects in Virginia, and they earn a mean yearly wage of $78,840, according to the Bureau of Labor Statistics. What kind of education will help me get a job in this field? Most jobs related to urban planning often require a master’s degree. 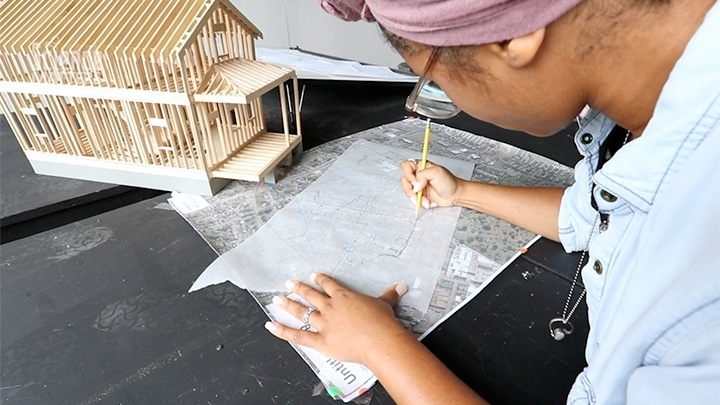 There are a variety of disciplines that contribute to urban design, and students can look for classes in architecture, geography, or engineering. What is being taught in Virginia Schools to prepare students for a career in this field? What are some resources for students who are interested in pursuing this line of work? The Branch Museum of Architecture and Design in Richmond, Virginia hosts an architecture camp for middle school students and offers a variety of exhibits and events. The National Building Museum’s website gives more information about the variety of exhibits and tours offered at the museum. The PBS LearningMedia website also offers videos on architecture and urban design as well as lesson plans that incorporate elements of sustainable architecture. Virginia Sea Grant advances the resilience and sustainability of Virginia’s coastal and marine ecosystems and the communities that depend upon them. As a broker of scientific information, and collaborating with seven partner universities, Virginia Sea Grant works with resource managers, businesses, communities, industries, and other stakeholders to provide and apply the best science available.